Whoever came up with the title of gorp? And does anyone ever use it anymore besides hippies and my mother? It’s been a huge hit with hikers and surfers and some say it is an acronym for “good ol’ raisins n peanuts” others say it’s just a list of ingredients like granola, oats, raisins and peanuts…. However it got it’s name and whatever the official ingredients include we have a new favorite around this house! It’s a hit and a great afternoon snack because along with a little sweet pick me up it also has some protein to hold the high metabolisms of my kids over until dinner is served. 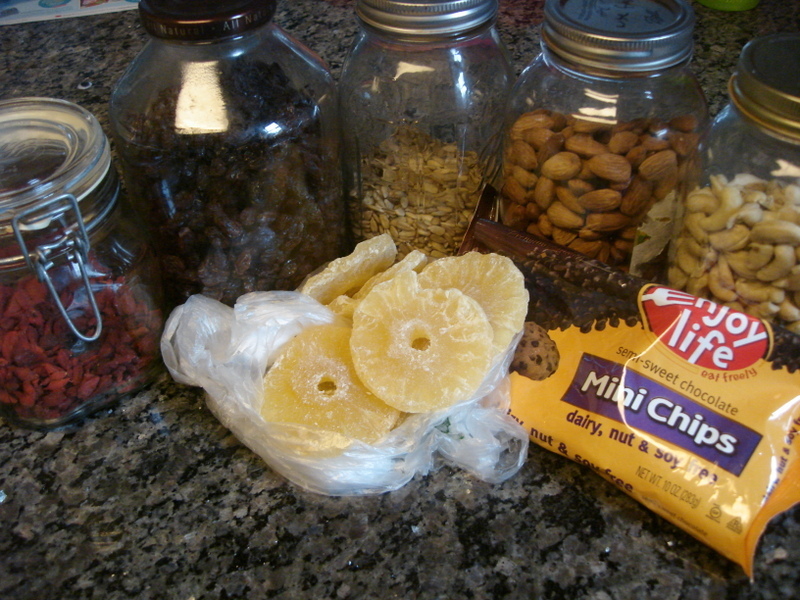 The mix we usually have contains dried pineapple. I usually purchase 4 or 5 fresh ones when they are in season and on sale and dry them all and save them through the winter. We ran out recently and we have all missed them! I know you can get plain ol dried pineapple at Trader Joes, which is AWESOME! The ingredient list simply states “dried pineapple” SO cool! Nothing added. I decided to get the kids a little treat last week and we purchased some that the ingredient list stated “dried pineapple and cane sugar”. I know… we usually swear off sugar, but it was a treat, we had run out and at least it didn’t have corn syrup in it right? or sulfur dioxide? Did I justify myself???? No.. .probably not… but either way… We used something a bit different this time around, but it’s good with the home dried version as well! So here is our new fav! Mix it all together and ration it out. If you don’t, it will disappear in one afternoon! Do you have a favorite mix? Tell me about it! I’d love to have some additional ideas! Previous What are they doing to our food? Bethanie, I love reading your blog posts. It’s like reading my childhood. (-: You have great ideas for meals that inspire me to cook and experiment myself. Thanks!